Closed circuits and closed loops that employ water as a primary medium are used extensively in many commercial, manufacturing and industrial process activities. To ensure that such closed circuit heating systems are well maintained and operate at optimum efficiency it is essential that the correct water conditions are maintained at all times. This can be achieved using carefully selected closed circuit water treatment chemicals. 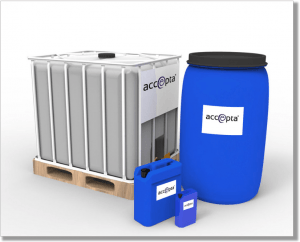 Accepta’s advanced closed loop and closed circuit treatment chemicals have been scientifically formulated to deliver significant operational benefits and performance improvements to heating systems and closed circuit systems including sea water cooling systems, closed chilled systems, low-pressure heating systems and other closed circuits that use water as a primary medium. Our extensive range of high performance closed loop treatment chemicals include anti-foulants, specific corrosion inhibitors, multi-functional scale and corrosion inhibitors, and anti-freeze and de-icing products for frost protection applications. The above terms are interchangeable and refer to system operating up to about 90oC and pressures of about 3-4 bar. The above terms are interchangeable and refer to systems operating above 120oC and pressures of 10 bar or greater. Chilled Water – A system circulating water below about 8oC cooled by a refrigeration or chiller plant. Chilled water systems may operate below 0oC being prevented from freezing by the addition of glycol, alcohol or brine as an antifreeze. Condenser Water – A circuit taking water away from a refrigeration plant to a separate heat rejection device eg. a cooling tower (temperature typically 20-40oC). Condenser water can either operate by an open circuit (where water goes directly over the cooling tower) or a closed circuit which loses heat to a heat exchanger or another open circuit. Performing analysis regularly is important to keep on top of your closed system water treatment levels as poor management can lead to scale & corrosion issues, reduced efficiency and even damage to critical systems. Ordering online is simple as Card and BACS payments are accepted, the lab will send out a Freepost returnable sample kit and provide a report of results soon after. Dosing pots are required in order to feed liquid chemicals such as corrosion inhibitors & biocides into closed systems. The dosing pot consists of a stainless steel vessel with inlet (return) and outlet (flow) valves, a drain valve and a filling valve. A stainless steel tundish, air release and non-return valve. Additional sizes up to 25L are available on request.